The sun may have set on another county season at the home of cricket, but the Gloucestershire celebrations will continue long into the night and many congratulations to them on a famous victory. However, there is not long to wait for our next cricket live text commentary, when England play the first Test against Pakistan in the United Arab Emirates on 13 October. There are Rugby World Cup and Premier League football live texts ongoing now but from us, thanks for your company. Cheerio. Quote Message: I feel very lucky and honoured to finish this way. What a way to walk out. For what it means to this group is amazing. I was on the boundary watching, usually I’m in the mix but it was a fantastic feeling to watch it. I feel very lucky and honoured to finish this way. What a way to walk out. For what it means to this group is amazing. I was on the boundary watching, usually I’m in the mix but it was a fantastic feeling to watch it. More from Gloucestershire assistant coach Ian Harvey: "There was talk at the start of the year, forget what happened years ago, this a big opportunity for this group of players over the next few years. They're young enough, talented enough and they have just got to believe." Gloucestershire assistant coach, their former all-rounder Ian Harvey: "Sanga was batting extremely well, we got lucky with his wicket and we always knew if we kept building pressure we may get a chance and one wicket may bring two. The belief was there, we never threw it away." Surrey captain Gareth Batty: "Disappointment, a little bit of shock, but we have to give credit to Gloucester, they fought like heck and it's a lovely send off for Jonesy. "We're developing as a club but today is a very sad day." Quote Message: I don’t know how we did it today but we squeezed and squeezed. Kumar Sangakkara and Rory Burns put on a good partnership but we put the pressure on, they lost some wickets and we were back in the game. The crowd were amazing. I’ve never played in front of such a big crowd. We started well with the ball but the [Sangakkara and Burns] partnership took it away from us. If they’d kept batting they would have won. To keep that composure when they’re on top is amazing. I don’t know how we did it today but we squeezed and squeezed. Kumar Sangakkara and Rory Burns put on a good partnership but we put the pressure on, they lost some wickets and we were back in the game. The crowd were amazing. I’ve never played in front of such a big crowd. We started well with the ball but the [Sangakkara and Burns] partnership took it away from us. If they’d kept batting they would have won. To keep that composure when they’re on top is amazing. Gloucestershire all-rounder Jack Taylor [who took the winning catch]: "I didn't have too much time to think about it which is good but it went in nicely. We had to rev ourselves up, we were a little bit down but we knew we could take wickets. Our fans have been awesome throughout the tournament and we're so thankful for their support." Quote Message: To be honest it’s unbelievable the way we fought back after they looked like they were cruising. We knew they had a strong top four, but they have guys who are young and not experienced and we put them under pressure. We didn’t quite stand up to their bowling but it was a super effort by Geraint (Jones) and even Jack Taylor to get us back against a score we didn’t think we had a chance of defending. Kumar Sangakkara is a quality player and you always want to get him out but it’s a pleasure to watch him play. The way this team has pulled together this season shows there have been huge improvements and it’s a pleasure to be part of. To be honest it’s unbelievable the way we fought back after they looked like they were cruising. We knew they had a strong top four, but they have guys who are young and not experienced and we put them under pressure. We didn’t quite stand up to their bowling but it was a super effort by Geraint (Jones) and even Jack Taylor to get us back against a score we didn’t think we had a chance of defending. Kumar Sangakkara is a quality player and you always want to get him out but it’s a pleasure to watch him play. The way this team has pulled together this season shows there have been huge improvements and it’s a pleasure to be part of. Geraint Jones is hoisted off the field in his final game before retiring and he tells Sky Sports: "Unbelievable! at the halfway stage we were a bit nervous, we weren't sure we had enough but the one thing this team has is ultimate belief, every single one of them believed we could do it and once we started taking wickets it was ours for the taking. The reason I moved to Gloucester was for the lads and it's a great way to go out." One of the great turnarounds. What on earth has happened?! Batty flicked Payne away but did not get enough on it and was caught on the boundary, Taylor holding his nerve to take the catch on the mid-wicket fence to the jubilation of the Gloucester fans, basking in the sunshine and the glory of their team's remarkable success. Surrey have gone from 143-2 in the 35th over to 214 all out. Extraordinary scenes. If Surrey don't lose any more wickets they could get 220 and win by virtue of losing one fewer wicket. Bowling hero Jade Dernbach is the last man, joining captain Batty who has strike as the batsmen crossed. A dot ball. Four left. Young Sam Curran has played superbly but he goes for a big thump and can only find deep mid-on. Bustling Benny Howell bowls the penultimate over and has a strong appeal for lbw against Burke, but umpire Nick Cook shakes his head and he's right again as it was heading past leg. And yet, as so often is the case in a tense finale, we have a run out. Pressure, a mis-field, confusion in mid-pitch and Burke is short of his ground seeking a single. Left-armer David Payne returns to the attack and he bowls an excellent full length with a hint of reverse swing. But with third man up, James Burke squirts the final delivery between the fielders and it gets through to the boundary. So 11 needed from the final 12 deliveries. Left-arm spinner Tom Smith completes his allocation, 2-42 are his figures, but Sam Curran is fortunate. He's beaten in the flight, gets a thick edge, there is no slip and it runs away for four to bring up the 200. He then calmly takes a single to keep the strike. Who's going to bowl the final overs? These low-scoring matches are often the best they say, and we have a cracker here in the September sunshine. James Burke is away immediately and the requirement is 27 from 25 balls. It won't be the Curran brothers leading Surrey home. Not a great decision by umpire Rob Bailey. Not the best of shots either, the reverse sweep never looks good when it doesn't come off. It was turning down the leg side but Jack Taylor is not concerned by that, he has three wickets. It's down to the Curran brothers as Tom joins Sam at the crease with 30 needed from 32. He has made 44 in this event this season and has the top knot covered by a brown Surrey lid. Some confusion in mid-pitch but the elder brother sends his younger sibling back and there is no damage. Imperious from young Sam Curran, skipping down the track to loft Smith handsomely for four. But the inexperience comes from the 40-year-old, Azhar Mahmood with a rush of blood, nowhere near it and he's gone! Benny Howell bustles in again, keeper up to the stumps. Young Sam Curran collects his third boundary, pulling a long hop through mid-wicket. Azhar Mahmood is persuaded to run two and the old boy makes it easily thanks to a mis-field, with 12 off the over. Just two singles from the Smith over. Surrey remain confident that their young and old partnership - 23 years between them - will see them home. We had that approach in our Eastergate Second XI circa 1989 but that was mainly because there weren't many players. The requirement is now 47 from 42. With the match seemingly drifting towards a Surrey win, the Gloucestershire fans have found their voices as their team make strides towards making a game of this final. Choruses of 'Gloucestershire la la la' are doing the rounds as the nervous Surrey fans applaud every run. It's suddenly got very tense on a breezy London evening. James Fuller completes his allocation and Mahmood has a wild yahoo at a wide one but makes no contact. He then remembers he is the senior partner with a 17-year-old at the other end and pushes a circumspect single. Flamboyant back-foot stroke from young Sam Curran and it's a first boundary for five overs, 49 needed from 48 balls. Azhar Mahmood is the new man, 40 years young and playing his 319th List A match. The fired up Glos fielders appeal for lbw for a forward defensive shot but umpire Nick Cook has none of it. Azhar is off the mark with a confident push into the covers. Quote Message: Surrey are about to throw this away. They're inching themselves closer to trouble. It's a good low catch, Gary Wilson's come down the wicket and tried to work against the spin. There's still a lot of work to do but the wicket's getting slower. Surrey are about to throw this away. They're inching themselves closer to trouble. It's a good low catch, Gary Wilson's come down the wicket and tried to work against the spin. There's still a lot of work to do but the wicket's getting slower. Surrey are doing their best to mess this up. It's a full toss, a low catch and it almost escapes the grasp of Glos skipper Michael Klinger, but he hangs on at short mid-wicket. Benny Howell is back in the attack, recovered from his earlier injury niggle, with five overs for 16. Wicketkeeper Gareth Roderick is full of chirrup and he is delighted with an over that concedes just a single. The last 10 overs then and 57 needed. Sam Curran, reminiscent of a young Leonardo di Caprio - if Di Caprio were wearing a Surrey helmet - looks perfectly relaxed for the big occasion, playing nice and straight and keeping the singles coming off left-arm spinner Tom Smith. Young Sam Curran is the new man, the 17-year-old did not have his best day with the ball and now he is going to have to knock a few runs off with his left-handed batting. He has a dart at his second ball and it skews off the edge to the boundary. Quote Message: Rory Burns was just stuck in the middle of no man's land and it's another fairly bizarre dismissal. Some more nip and tuck to come here, you feel. Rory Burns was just stuck in the middle of no man's land and it's another fairly bizarre dismissal. Some more nip and tuck to come here, you feel. Surrey boss Alec Stewart won't be happy with that. Rory Burns storms down the wicket and tries to heave over mid-wicket but there is turn, it goes past the bat and it's a simple stumping. Both of the Surrey big-scoring left-handers dismissed within four overs. Seamer James Fuller returns, having taken 2-19 from his first seven overs. Burns keeps the strike with a single off the final ball. So with Sanga gone, Ireland's Gary Wilson is the new batsman and the requirement looks a little different. Surrey need 76 from 90 balls with seven wickets intact. What happens next? Perhaps even the great Kumar Sangakkara switches off. He has hoicked a full toss from Jack Taylor straight to former England stalwart Chris Tavare's nephew Will at mid-on, not a piece of cricket usually associated with the great man, who questions whether the ball was over waist height. It wasn't. Not even to James Taylor. Quote Message: Rory Burns has been absolutely brilliant this year and this innings shows his maturity. He's come through from the academy and this season he's really kicked on and taken his maturity on to another level. Rory Burns has been absolutely brilliant this year and this innings shows his maturity. He's come through from the academy and this season he's really kicked on and taken his maturity on to another level. Benny Howell bolts back on to the field as the bearded Jack Taylor returns to the attack with his off spinners, delivered with a jaunty skip at the start of his run rather like a dressage horse. Sangakkara clips a neat two into the leg side. Too easy, and the cliche 'batting masterclass' is looming. Benny Howell has to leave the field, he has strained a fetlock in his delivery stride by the look of things. The rangy left-arm seamer David Payne has to complete the over, prompting Kumar to don the helmet again. The Sri Lankan is so composed he could virtually play with no pads. Burns takes on a two to mid-wicket with surely no need, but the dive works and he's home. Quote Message: From a batting point of view, Surrey are milking it. There's plenty of gaps out there and the wicket is still good. It's easy enough just to work the ball into the gaps. Gloucestershire are not asking a massive amount of questions of Surrey, at the minute. From a batting point of view, Surrey are milking it. There's plenty of gaps out there and the wicket is still good. It's easy enough just to work the ball into the gaps. Gloucestershire are not asking a massive amount of questions of Surrey, at the minute. No justice for Smith, he induces a top-edge from Burns which seems certain to result in a wicket. The ball loops in the air for an eternity but drops safely to mid-on for a single. The Gloucestershire fans are enjoying the warm afternoon sunshine and are treating the Lord's members to some 'songs', no doubt influenced by frequent visits to the refreshment areas. Howell maintains a disciplined line but the run-rate is not a concern for the two left-handers, and only 99 are now needed from the final 20 overs. Sangakkara, sporting a lightweight cap against the spinners, reaches a nonchalant fifty from 71 balls, 34 of which have come in singles. Smith is not troubling him it is fair to say. Howell continues, wicketkeeper Gareth Roderick is up to the stumps, maintaining an admirably optimistic approach with his encouragement from behind the timbers in clipped Natal tones, but Sangakkara has so much time to manoeuvre the ball into the gaps. Slow left-armer Smith continues. He began his career with the oldest county, good old Sussex by the sea. He's accurate, but there is no dramatic turn and Burns paddle sweeps easily for two. There is then an lbw appeal but Nick Cook, who will have had many appeals himself as a left-arm spinner, shakes his head. Way outside the line. Thanks Paul. Well, Surrey were actually behind at the halfway stage, in terms of runs anyway, Glos had made 109 but had lost five wickets. Tom Curran and skipper Gareth Batty don't look too concerned, they are having a whale of a time with some blokey antics on the balcony. Sangakkara pulls a Jack Taylor long hop dismissively for four, only his third boundary, although he is almost playing with one hand behind his back. It appears Tom Smith's nickname is Smudger. That must make it interesting when he meets former seam bowler, and BBC Radio Gloucestershire summariser, Mike Smith. "Hello, Smudger, how are you?" "I'm OK, Smudger, how's yourself?" Surrey's total moves into three figures with Kumar Sangakkara looking ominously comfortable. Now, to take you through to end of the final, I pass the 'typing torch' to Jamie Lillywhite. Jack Taylor continues plugging away, yielding only three runs, but Gloucestershire won't win this unless they break this partnership in the not too distant future. Quote Message: What's been impressive is that Kumar Sangakkara has taken nothing for granted. He's been very professional and prepared well for the game, giving an example of why he is the best player in the world. What's been impressive is that Kumar Sangakkara has taken nothing for granted. He's been very professional and prepared well for the game, giving an example of why he is the best player in the world. Tom Smith is the sixth bowler tried by Gloucestershire skipper Michael Klinger. Slow left-arm from Smith, tidy enough, but the two batsmen are happy to pick him off for singles. Rory Burns is down the track to turn Jack Taylor's opening ball into a full toss which he duly despatches for four. The 50 partnership comes up off 61 deliveries, but you get the impression that Sangakkara is just biding his time at the moment. Benny Howell exhales loudly with the effort of striving for another wicket for Gloucesteshire. He hasn't looked particularly threatening so far, but isn't giving Surrey any four-balls. Rory Burns slices uppishly through point from Jack Taylor's opening delivery, and the bowler gains a moral victory by turning one off the straight which skews away off the outside edge. Burns has the final word, though, but hitting the last all of the over through mid-on for four. Gareth Roderick is standing up to the stumps to try and prevent the Surrey batsmen using their feet to Benny Howell's medium pace. The two batsmen, however, are content to pick up an occasional run, with plenty of time left to reach the target. Rory Burns misses an attempted paddle sweep and is struck on the pad, but avoids an appeal by getting his front foot outside off stump. Only a single from the over, but one feels Gloucestershire need another wicket - and from their perspective, preferably Sangakkara's. A double change as all-rounder Benny Howell takes up the attack for Gloucestershire. He took three wickets in the semi-final win over Yorkshire and they could do with a repeat performance. In days of yore, bowlers of Howell's pace would be called 'military medium', but he maintains a tight line, conceding only a couple of singles, with the encouragement of 'Come on Benno' and 'Yes, Benny lad' shouts from wicketkeeper Gareth Roderick. How will Surrey react to the introduction of spin from Jack Taylor? Like Gareth Batty in the Gloucestershire innings, the first ball is a loosener and Rory Burns puts it away for four. Taylor doesn't seem frightened to give the ball some air, and the rest of the over is tidy. Craig Miles overpitches and Rory Burns strokes it through mid-on for his first boundary. A shorter ball is pulled down to fine leg, but this time there is only two runs in it. Kumar Sangakkara dabs down close to the wicket and Surrey pinch a cheeky single as wicketkeeper Gareth Roderick fields to his left. Ten from the over. James Fuller is human after all as he sends down a leg-side wide. That apart, though, it's the same probing line and length that has served him well so far. Fuller forces Sangakara to duck a bouncer from the final delivery, but umpire Rob Bailey calls it a no-ball giving Surrey a free hit. A well-directed yorker only costs Gloucestershire a single. Now, is there a seed of doubt growing in the Surrey changing room? Not while Kumar Sangakkara is still in the middle, I suspect. Rory Burns, the third left-hander in Surrey's top four, gets his score moving with a single to mid-wicket off Crag Miles, but that's another good over with only four conceded. Quote Message: James Fuller got a little bit of extra lift on that one playing the bounce. Gloucestershire will feel with that extra wicket that there's a bit more in the game. Fuller has bowled a very disciplined line and length. James Fuller got a little bit of extra lift on that one playing the bounce. Gloucestershire will feel with that extra wicket that there's a bit more in the game. Fuller has bowled a very disciplined line and length. Brilliant from James Fuller who goes round the wcket for the final ball of the over. The change of angle bamboozles Steven Davies, who jabs it down into his stumps. Quote Message: James Fuller and David Payne have been on the money and forced Surrey to work for runs. Both batsman have had to find ways to score. That's a sign that there's not much let up. James Fuller and David Payne have been on the money and forced Surrey to work for runs. Both batsman have had to find ways to score. That's a sign that there's not much let up. Yes, I am clairvoyant - Craig Miles comes on to give David Payne a rest. But don't worry, despite my powers, I'm not going to give away the result of the game!! Tall and rangy, can 21-year-old Miles emulate the tight bowling of his team-mates? It is not a bad start, but the final ball is on leg-stump and Kumar Sangakkara clips it to the mid-wicket boundary. James Fuller's attempted yorker is forced away past mid-off by Steven Davies and Surrey collect three. A single to Sangakkara is all she wrote thereafter - Fuller has 1-10 from five overs, but Gloucestershire may soon have to consider a change. Glorious. That wasn't even a half-volley by David Payne, but Kumar Sangakkara drives it magnificently through extra cover for four. As effortless as David Gower in his prime. Still a useful over by Payne, though. Jason Roy gave his wicket away by allowing himself to become frustrated. Steven Davies is finding it just as difficult and his call for a quick single from the final ball does not do any favours to partner Kumar Sangakkara, but the throw from backward point misses the stumps. Kumar Sangakkara been there, seen it and bought t-shirts in a whole rainbow collection of colours, so he's unlikely to be ruffled by the accuracy of the Gloucestershire new-ball pair. He gets under way with a quick single off David Payne, but Davies can make nothing from the rest of the over. A smidgen of pressure now on Surrey? Quote Message: If Gloucestershire can bowl a good delivery to Kumar Sangakkara early on then concentrate on bowling at Steven Davies and keep the Sri Lankan off strike, frustrated, facing fewer balls for as long as possible, then see what happens. If Gloucestershire can bowl a good delivery to Kumar Sangakkara early on then concentrate on bowling at Steven Davies and keep the Sri Lankan off strike, frustrated, facing fewer balls for as long as possible, then see what happens. Wicket maiden for Fuller. This has been highly impressive stuff from him. Jason Roy tries to pinch a single to backward point but is sent back by Steven Davies. The next ball from James Fuller is a beauty and again flies past the outside edge. Frustrated, Roy attempts to pull the next delivery and mis-hits to cover where Tom Smith jumps to take the catch. It's Sangakkara time! Jason Roy swipes unconvincingly at an angled ball from David Payne and the ball flies away to square leg for four off an inside edge. Roy plays and misses later in the over and is certainly lacking his usual fluency. The two Gloucestershire bowlers are asking plenty of questions - but it's wickets they need. James Fuller is up around the 90mph mark, so he's no slouch with ball in hand - and he's also bowling an excellent line to Steven Davies too. That's an excellent maiden for the South Africa-born 25-year-old. David Payne strays onto Steven Davies' pads and the left-hander flicks it away for an easy single. Wider deliveries tempt Roy into a couple of unbalanced swishes outside off stump and he makes no contact with either. James Fuller starts out with a wide long hop which Jason Roy clobbers without ceremony through the covers for four. He responds by striking Roy on the pad, but the umpire has absolutely no interest in the lbw appeal - the ball would have cleared the stumps. Another good ball to end the over hits Roy's front pad, but he is saved by an inside edge. Decent start by Fuller, apart from the first ball. Left-armer David Payne immediately goes past the outside edge of Jason Roy's bat, but the second ball is whipped down to fine leg for Surrey's first run. Steven Davies also plays and misses at his first delivery, playing outside the ball with a slightly crooked bat. He then nudges down to third man for one. Decent start by Payne, offering nothing loose to the two openers. So, it's time for the start of Surrey's innings at Lord's - target 221. Too easy, surely? But you never know. As far wiser souls than I have said, cricket is a funny game. A nice touch by Gloucestershire as Geraint Jones, playing his last match before retirement, is allowed to lead them out onto the ground. He's already scored 50 - does he also have a major contribution to make in the field? Kumar Sangakkara is arguably the greatest wicketkeeper/batsman in the history of cricket. I say arguably, but it's very hard to argue against a man with 28,000 international runs behind him, as well as over 600 catches and almost 140 stumpings, and all done in his own relaxed, highly competent style. Sangakkara is the consummate professional cricketer, as he has shown with his consistent performances this season for Surrey. He hit two centuries against England at Lord's last year - and one in this week's Championship game against Lancashire. Does he have another special innings in the locker to light up what may be his final appearance at the game's most iconic cricket venue? Surrey, of course, are still in the hunt for a double. 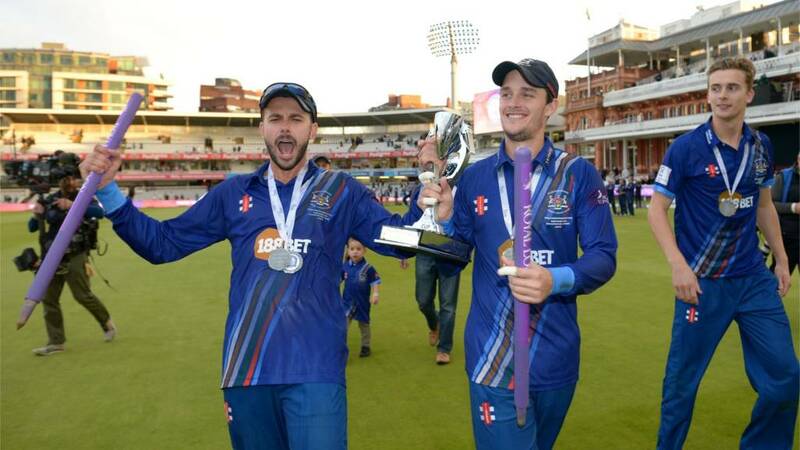 Should they beat Gloucestershire today, they will go on to try and win the Championship Division Two title.They play Northants at The Oval in their final game of the summer, starting on Tuesday, and will go into it with an eight-point lead over rivals Lancashire. You have to feel that for Gloucestershire to win this final, they are going to have to make some inroads with the new ball at the start of Surrey's innings. Most teams would love a top four of the quality of Jason Roy, Steven Davies, Kumar Sangakara and Rory Burns, so Michael Klinger's side cannot afford to let any of them get well-set, with only a modest total to defend. The selection of Craig Miles should boost their firepower. He is undoubtedly one of the best young pacemen in English cricket, with 68 wickets this summer in all competitions. Quite sad seeing that Ben Hollioake graphic below. Had he not died so tragically in a road accident in 2002, the gifted all-rounder could still have been part of this Surrey side. He would only have been 37, the same age as Surrey skipper Gareth Batty and three years younger than Azhar Mahmood. 1973 (Gillette Cup winners), 1977 (Benson & Hedges Cup winners), 1999 (Benson & Hedges Cup winners), 1999 (NatWest Trophy winners), 2000 (Benson & Hedges Cup winners), 2000 NatWest Trophy winners), 2001 (Benson & Hedges Cup runners-up), 2003 (C&G Trophy winners), 2004 (C&G Trophy winners). Well Gloucestershire have mustered a total you would imagine would not be enough, but having lost their talisman Klinger for a third-ball duck it is at least something to bowl at. So, in half an hour or so Surrey will begin their reply, needing 221 at less than four-and-a-half an over. To describe the first part of the innings I hand you to Paul Grunill . Hat-trick hero Jade Dernbach on Sky Sports: "It's an amazing feeling to be able to contribute to what was an outstanding bowling performance, it was about time I contributed. Come mid-September you're probably looking at the pitch and saying it is the most helpful time to bowl. I've worked at my new ball bowling and luckily it came off. "You get a gut feel, it's not often it comes off but today was my day. Perhaps people were waiting for variations but I wanted to get my stock ball right. It's only half a job though so hopefully the batsmen go out and knock those off." Quote Message: When that comes out, Jade Dernbach's arm is coming at the same speed. The batsman is thinking it's going to hit his head so he ducks, but the fact is, that's missing leg stump by quite some distance. When that comes out, Jade Dernbach's arm is coming at the same speed. The batsman is thinking it's going to hit his head so he ducks, but the fact is, that's missing leg stump by quite some distance. Hat-trick for Dernbach! It's a terrible decision as it transpires, it hit him on the back as he ducked a full toss and was missing leg stump, but umpire Rob Bailey has given it and Glos are all out. Surely 220 isn't going to be enough against a powerful Surrey top order? Dernbach finishes with figures of 6-35, the best figures in the competition this season - what a time to do it for the multi-tattooed paceman. First ball dismissal and Dernbach is on a hat-trick, an inside edge to keeper Gary Wilson and the much-maligned Jade has a five-for. He's never far from being pumped up and he's certainly fully inflated now. Geraint Jones brings up fifty from 64 balls with his fourth four but then hears the death rattle as a yorker from Jade Dernbach thuds into the timbers and signals the end for the former England wicketkeeper, who is retiring at the end of the season. After conceding 20 in his previous over, Tom Curran sends in the yorkers and has much better returns, with just singles and one two conceded. James Fuller is the new man, with a highest score of 45 this year. He is greeted by a Dernbach bouncer but takes a single off the final ball. Quote Message: It's very good catch by Sam Curran. A yard either side and it would have been another boundary. Jack Taylor has batted really well but every time Gloucestershire claw back another position, Surrey just nip it in the bud. It's very good catch by Sam Curran. A yard either side and it would have been another boundary. Jack Taylor has batted really well but every time Gloucestershire claw back another position, Surrey just nip it in the bud. Jade Dernbach is going through the repertoire and a slower ball is a full toss which is delightfully put away through extra cover for four by Taylor but then from a low full toss he's caught at backward point and a 26-ball cameo ends too early for Gloucestershire's liking. Only the second six and again it has come from a full toss. Taylor is clearly not a man to bowl that to, but what happens? Tom Curran bowls the same delivery and that is dispatched even further over mid-wicket for six more. Then there's a mis-field,and Jones plays a vintage cover drive for four, 200 up and 20 off the over. Jade Dernbach, oh the texts we used to get when he played for England...but his first six-over spell produced a superb 2-18. Improvisation from Jack Taylor, who moves way across his stumps and shovels one with a short backlift through the leg side for four. Tom Curran continues, an open-chested action and he's in the early 80s mph. Jack Taylor clips a slower ball for two but there are no boundaries again and the rate is barely above four. Six an over from here only gets them to 217. Tom Curran is a spirited young man, he gives it the old threaten to throw but there is no Mitchell Starc-style incident as he does not release the ball. The first maiden of the match, and not what Gloucester need with only nine overs left. Jack Taylor is the new man, and he has made 156 from 125 balls against Northants in the County Championship this year. He won't have time for that but a similarly aggressive innings would be appreciated by the Gloucestershire contingent. Well they had to go for it but Tom Smith was short of his ground in pursuit of a quick single, Jade Dernbach at backward point fires in an accurate throw and bowler Gareth Batty whips off the bails. Tom Curran returns, his top knot glistening in the sunshine. A top knot to the Lord's members would previously have only meant how they fasten their egg and bacon ties. He has a menacing approach to the crease does TC and it is only singles that result. The fifty partnership arrives from 84 balls. Quote Message: Gloucestershire's running has been excellent. They've scampered twos and that's a real credit to them and how they've got to the final. They've worked really well together as a team. Gloucestershire's running has been excellent. They've scampered twos and that's a real credit to them and how they've got to the final. They've worked really well together as a team. Burke keeps them to singles and it is another lull, a fourth over without a boundary. Umpire Nick Cook is having a super game, that lbw appeal against Smith looked to be bang in front but the former England spinner is right again and it was angling down. Still super figures for Azhar Mahmood, 2-28, with only one six and one four conceded. He's gone straight off, maybe to that bath, and a substitute has come on. James Burke's first two overs have gone for 13 but he's kept in the attack and he keeps it tighter in this one. The 150 up for Glos and with both batsmen set, can they afford to wield the willow yet? Looks like Azhar Mahmood is going to bowl through his 10 overs here, and then dream of a hot bath perhaps between innings. Another lbw appeal with that ball nipping back to Geraint Jones but the not out decision is correct as it angles down. Burke strays, barely pitching on the cut strip wide of off stump and Jones cue ends it through the vacant slip cordon for another four. A leg-side wide from Burke, and Glos are building as the partnership moves to 34. That's woken the crowd up, a rare Azhar Mahmood full toss and Geraint whips it away over cow corner for the maximum. Mahmood then nips one back and raps him on the pad but not out is the decision, replays show it was clipping leg stump, but there is none of that DRS business in this match. Quote Message: Surrey are strangling the middle overs. Azhar Mahmood is playing a very important part, bowling very straight and using his experience so the batsman don't have any opportunities. Surrey are strangling the middle overs. Azhar Mahmood is playing a very important part, bowling very straight and using his experience so the batsman don't have any opportunities. Seamer James Burke replaces his captain, he took 5-28 in this competition against Derbyshire this year. He begins with a no-ball but the free hit is merely edged to the keeper by Smith. The Surrey faithful are certainly enjoying their day at a resplendent Lord's as their side takes a strangle hold of proceedings in the beautiful sun in London. Current hot commodities, the Curran brothers, are even taking the time to sign a few autographs between balls to add to their already growing likeable personalities." Azhar Mahmood has not played a 50-over match for over a year and his run-up is decidedly streamlined off about half a dozen paces these days, but he continues to frustrate the batsmen and limit them to singles. If you want to follow what's happening at the Rugby World Cup , while reading this live text and listening to the commentary, just open another tab and see what Brendon Mitchell makes of Tonga v Georgia in Gloucester by clicking here. Maybe some of the Gloucestershire players might have been at Kingsholm if they hadn't been otherwise engaged at Lord's. Another over without a boundary, Gareth Batty conceding four singles. When do Glos press the accelerator? Can they risk it yet? Their fans have had occasional bursts of merriment but they'd like more reasons to cheer in the warm autumnal sunshine. Geraint Jones averaged 24 in his ODI career for England, with a best of 80. That would be useful today. They can't get Azhar Mahmood away though, and just a single results from the wily fox's sixth over, 2-15 for him. The combative and wily Gareth Batty is breezing through his overs from round the wicket, making elaborate prose difficult. Geraint Jones is 39 now but he still looks like a teenager scampering between the wickets, but it's only singles again. Mahmood was an established international for Pakistan before Sam Curran was born and his experience is telling again here, an immaculate line on and around off stump. A fourth successive over without a boundary. How Glos could do with a Mark Alleyne century here. But it's a just a single from the over. Quote Message: It's a fairytale return for Azhar Mahmood and a fantastic return for Surrey over two spells with the club. It was very tight to Gareth Roderick and messing with the slope, you are taking a chance. Gloucestershire are in real trouble. It's a fairytale return for Azhar Mahmood and a fantastic return for Surrey over two spells with the club. It was very tight to Gareth Roderick and messing with the slope, you are taking a chance. Gloucestershire are in real trouble. Tom Smith's best score in the One-Day Cup this season is 37 not out. They need a lot more than that from him now. He gets under way with a single. And with that, I hand over to my esteemed colleague Jamie Lillywhite to take you through the second half of Gloucestershire's innings. It's that man Azhar Mahmood again as Gareth Roderick chops an angled delivery into his stumps. That was the key wicket for Surrey, the right-hander having been there since the third ball of the innings. Things looking bleak for Gloucestershire now with only the lower order to come. As well as playing for England, Geraint Jones also represented Papua New Guinea, the country of his birth, at international level. Very few county cricketers can claim that double distinction. He can only add one run to his score from another canny over by Surrey skipper Gareth Batty. Geraint Jones is under way with four runs off Azhar Mahmood - a 39-year-old facing a 40-year-old. How many other sports could that happen in at a major cup final? Quote Message: It's nipped back a little bit but you need to expect that at Lord's when someone's bowling the Pavilion End. Even if Benny Howell had hit it, it wouldn't have gone anywhere. It's nipped back a little bit but you need to expect that at Lord's when someone's bowling the Pavilion End. Even if Benny Howell had hit it, it wouldn't have gone anywhere. Another major setback for Gloucestershire as Benny Howell is clean bowled by Azhar Mahmood after making the cardinal mistake of leaving a gap between bat and pad (the first lesson my grandad taught me was don't leave a gap between bat and pad!). They badly need Gareth Roderick to bat most of the innings now. Geraint Jones - and Ashes winner in 205 - receives a generous ovation as he walks out for the final innings of his career. Gareth Batty tries his luck from round the wicket to Benny Howell, who is bamboozled totally by the final ball of the over which spins back and clips the top of the pad before running away for three leg-byes - 100 up for Gloucestershire. Azhar Mahmood produces a bouncer and Benny Howell is not in full control of his pull shot as he picks up a single. Only two from the over. With the ball turning, Gareth Batty brings in a leg-slip, but Benny Howell is undaunted as he stretches forward to sweep his first boundary. Who'll be the happier side at the moment - Surrey or Gloucestershire? How many do you think Gloucestershire will make? Let us know using #bbccricket . Quote Message: I think Hamish Marshall was doing the right thing there but Gareth Batty might count himself a little bit lucky that he's forced a mistake. He's pushed most of his deliveries down the legside and he hasn't quite found his rhythm. I think Hamish Marshall was doing the right thing there but Gareth Batty might count himself a little bit lucky that he's forced a mistake. He's pushed most of his deliveries down the legside and he hasn't quite found his rhythm. Cricket is certainly a game for all the ages - if you add those of Tom and Sam Curran together, they are still three years short of the venerable Azhar Mahmood. A veteran of 21 Tests and 143 one-day internationals for Pakistan, Mahmood is a wily campaigner and Gloucestershire do not take any liberties from his opening over. A loud lbw appeal against Roderick is turned down with ball jagging back off the pitch. Four off it. Benny Howell is a developing all-round talent and Gloucestershire need him to fire with both bat and ball today. He is under way with a single but a smart piece of fielding by 40-year-old Azhar Mahmood from the final delivery earns him the chance to turn his arm over for Surrey. Looks like Gareth Batty's leg-side line is a deliberate tactic as Hamish Marshall is lured out of his crease and Gary Wilson makes a smart stumping. The fact that the delivery is also called a wide does not dampen the Surrey celebrations. Gloucestershire now in serious strife with two of their two most experienced batsmen back in the dressing room. Hamish Marshall drives and Gareth Batty makes an excellent diving save at mid-off to keep Gloucestershire to a single. Sam Curran overpitches again next ball and this time Gareth Roderick finds the gap and the ball scoots away to the rope. The final delivery is short, but Marshall picks out the man at deep square leg and has to settle for one. Time for spin as Surrey skipper Gareth Batty brings himself into the attack. The first ball is a loosener down leg-side which Gary Wilson fails to take and it runs away for five wides. Batty follows it with another wide prompting jeers from a section of the crowd and Surrey give away another run as Jason Roy throws at the stumps and the ricochet runs into a gap. Jeers break out among a section of the Gloucestershire supporters - and 11 from the over make it a good one for their team. Sam Curran gives Hamish Marshall room outside off stump but with four for the taking, the New Zealander cuts straight to the fielder at backward point. It is Curran's best over so far, but Marshall takes a single to mid-off from the final delivery to deny him a maiden. Tom Curran finds a little bit of lift as Gareth Roderick fends the ball off for a single. But the young bowler strives again for a little extra pace and Hamish Marshall lofts a controlled on-drive away for four. Sam Curran relieves Jade Dernbach from the Pavilion End and a short ball is pulled away for one by Gareth Roderick to take the total to 50. Hamish Marshall tries to dab an angled ball away past the slip cordon, but it is too close to him for the shot and he fails to make contact. Roderick collects a single to mid-off to end the over, with Surrey very happy with the situation at this stage of proceedings. Gareth Roderick tries to unsettle Tom Curran by moving across his stumps, but it doesn't bring him any runs and only two come from the over. Gloucestershire need a major partnership, but a few boundaries would certainly help their cause at this stage. Jade Dernbach carries on and for the first time digs in a bouncer which Hamish Marshall plays well, keeping his eye on the ball and swaying out of the way. It is only Marshall's third game in the One-Day Cup this summer, but his experience could be crucial if Gloucestershire are to make a defendable total. He is fortunate from the final delivery as the ball spoons up off the outside edge as he tries to play to leg, but falls well short of cover. Gareth Roderick certainly wouldn't win any plaudits from cricket purists for his batting style, but it is effective enough, judging by his 334 runs in the earlier rounds of the One-Day Cup. He nudges a single into the leg-side before Hamish Marshall opens his account with a neat flick behind square for two. Quote Message: You want to see the youngsters come through but I think it was the right decision [to select Azhar Mahmood] with Zafar Ansari gone. In a final do you go to a younger bowler or do you go to your man who will hold his nerve? You want to see the youngsters come through but I think it was the right decision [to select Azhar Mahmood] with Zafar Ansari gone. In a final do you go to a younger bowler or do you go to your man who will hold his nerve? Figures of 2-16 from his first five overs are good reward for Jade Dernbach. Hamish Marshall is content to block the final two deliveries, and Gloucestershire certainly need a major innings from the former New Zealand Test player. A huge appeal from Jade Dernbach for a catch down the leg-side from Hamish Marshall's first delivery faced, but umpire Nick Cook rules there was not bat involved after the ball flies to wicketkeeper Gary Wilson. Another setback for Gloucestershire as Chris Dent tries to drive Jade Dernbach with his weight not properly forward and drills a comfortable catch to Azhar Mahmood at mid-off. He didn't even have to move. Tom Curran has enjoyed a magnificent season in the Championship with 66 wickets. Can he produce a second breakthrough for Surrey? His hair scraped back into a chopped-off ponytail, the 20-year-old finds a good line and length straight away. Gloucestershire are lucky to escape from the final ball as a direct hit would have run out Roderick as he comes back fro a second. Another good over by Jade Dernbach restricts Gloucestershire to just three runs. They will be content enough though at this stage. Time now for Tom Curran to replace his younger brother Sam. Quote Message: It's not easy on the follow through and Sam Curran's running in at a lot of pace. It's his wrong hand so it would have been a hell of a catch but it's a good effort. It's not easy on the follow through and Sam Curran's running in at a lot of pace. It's his wrong hand so it would have been a hell of a catch but it's a good effort. Sam Curran strays onto Chris Dent's pads and the ball is effortlessly flicked through square leg for a boundary. The left-hander hasn't managed a single fifty in the competition thus far - today would be a perfect day for him to come to the party, but the party is almost over when he checks a stroke later in the over and Curran spills a one-handed return catch. To add insult to injury, Dent thumps the final delivery of the over through the covers for another four. Jade Dernbach throws his arms in the air as a brave - but some might say positive - leave by Chris Dent sees the ball pass close to off stump. Gareth Roderick drives a delivery that is slightly overpitched, but doesn't time it perfectly and has to settle for one. It's a steady start by Gloucestershire, but hardly surprising after the shock of losing Michael Klinger in the opening over. Chris Dent appears to have a habit of playing forward defensive strokes with his bat fractionally behind his front pad, which could make him a candidate for lbws, but when Sam Curran drops short, he cracks the ball away square off the back foot for four. Curran responds with a beauty which just beats the outside edge, an excellent comeback by the highly-rated youngster. Chis Dent is squared up by the first ball of Jade Dernbach's second over, but the ball flies away for a single off the outside edge. A wide down the leg-side adds another run to the total, but that apart, it's a fine start by Dernbach, whose England career appears to be behind him at the age of 29. His last appearance was in a World T20 game against South Africa in March last year. Quote Message: With an opening bat, you are used to scoring runs but sometimes you get a low score as well. It's very disappointing in a big final but I'm with sure his experience he won't let it show and affect the rest of the team. With an opening bat, you are used to scoring runs but sometimes you get a low score as well. It's very disappointing in a big final but I'm with sure his experience he won't let it show and affect the rest of the team. Who is the youngest cricketer to play in a Lord's final? There certainly can't have been many younger than Sam Curran, who is entrusted with the second over at the age of 17 years and 208 days. He doesn't have express pace, but is certainly nippy enough and finds early swing, but dropping short isn't a good tactic and Gareth Roderick puts him away for four. After the shock of losing their captain, and leading batsman, to the third ball of the game, Gloucestershire get their first runs on the board as a thick edge by Gareth Roderick runs away for four to third man. The boys from Bristol are immediately on the back foot and need to regroup. Surrey opt for experience first up with Jade Dernbach given the ball ahead of the precocious Curran brothers - and it's a move that pays off instantly as Michael Klinger slashes at a wide delivery and gives Gary Wilson a straightforward catch behind the stumps. Just over a decade ago, Gloucestershire were, without question, the kings of limited-overs cricket. Astutely guided by coach John Bracewell and with a team featuring inspirational Aussie all-rounder Ian Harvey, they won seven trophies between 1999 and 2004. Harvey is now on the coaching staff and doing his bit to try and help a new generation bring the glory days back to Bristol. BBC Points West went to meet Harvey and members of the current squad and you can watch what they had to say about the team's prospects against Surrey, by clicking here. With Surrey having opted to bowl first, the spotlight will immediately be on Sam and Tom Curran. Even though they are only 17 and 20 respectively, Sam and Tom have become the spearheads of the Surrey attack. Alec Stewart says Sam is the best 17-year-old he has ever seen and though neither was chosen for the England Lions squad this winter, it is quite conceivable that both will considered for international honours soon. The One-Day Cup final will be anemotional occasionfor former England wicketkeeperGeraint Jones, who plays his final game for Gloucestershire before retiring. "I could be a blubbering mess," admitted the 39-year-old, who was part of the Kent side beaten by Essex in the FP Trophy final in 2008. He made six of his 34 Test appearances at the home of cricket and was only on the losing side once, against Australia in 2005, but England, of course, turned that series around for one of the most famous Ashes triumphs of the modern era. Surrey skipper Gareth Batty is now 37, with 19 years of service behind him for three counties and his country. The former England off-spinner was a Lord's winner with Surrey in 2011, in the CB40 final against Somerset. But he has also twice lost there with his previous county Worcestershire, in the old C&G Trophy, in 2003 and 2004 - each time to Gloucestershire. Although he does have the experienced figure of Sri Lankan star Kumar Sangakkara at his disposal, Batty admits there is some excitement within his young team at the prospect of playing in a Lord's final. “I feel a bit like a parent must do on Christmas Eve trying to calm the kids down," he told BBC London 94.9. "The boys are absolutely chomping at the bit. Last week, Gloucestershire captain Michael Klinger said he had not given up hope of playing international cricket for Australia, even though he is 35. With Chris Rogers and Michael Clarke both leaving the international stage after the Ashes series, an opening was there - but the Australian selectors decided it was time to look for younger options to fill the gaps when they named the squad to tour Bangladesh. After his starring role in Gloucestershire's semi-final victory, he now has the opportunity to show off his batting skills on the grandest stage of them all. Did Australia get it wrong? Let us know on Twitter using #bbccricket. There are a number of options to listen to match commentary today, and enjoy our live text at the same time. Test Match Special will be on BBC Radio 4 LW from 10.15 BST, and BBC London 94.9 and BBC Radio Gloucestershire also have their own commentary teams at the ground. Click on the live coverage tab at the top of this page to make your choice. Who is going to win the One-Day Trophy? We want your opinions, so please get involved during the match via Twitter using #bbccricket.